I’m not sure that many people know how easy it is to make a bowl of oatmeal for breakfast. You can be enjoying a delicious bowl of whole, rolled oats – not the instant variety – in as little as ten minutes, from measuring to serving. High in protein, dairy free yet rich and creamy, these three variations on basic oatmeal, topped with fresh summer fruit and a little sweetener, make filling breakfasts that keeps you satisfied until lunchtime and beyond and take full advantage of the season’s bounty. 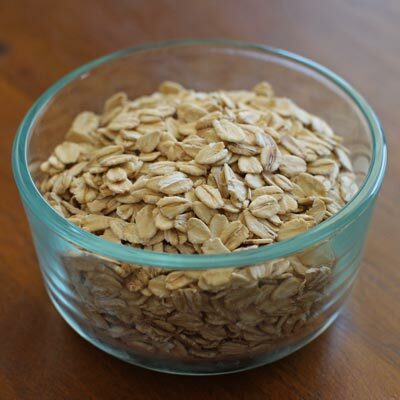 I use organic extra-thick old fashioned rolled oats from Bob’s Red Mill, and I buy them from Vitacost.com. I like the texture of the extra-thick oats, but any rolled oats will do. Note that steel-cut oats take significantly longer to cook, so this recipe will not work for those. Combine all the ingredients in a saucepan with a lid. Bring to a boil and then lower to a simmer, stirring frequently, for five minutes. Place the lid on the saucepan, remove from the heat and let stand for another five minutes. While the oatmeal is standing, prepare your toppings. If this takes longer than exactly five minutes, no harm done. This recipe makes enough for one generous serving, but is easily doubled to serve two people. While the oatmeal is standing covered in the saucepan, wash and chop your fresh berries. 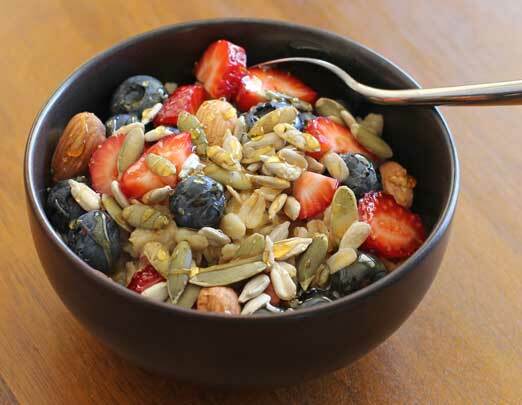 Transfer the cooked oats to a bowl, top with the berries and sprinkle with your favorite nuts and seeds, which ideally you have soaked and dehydrated in advance for improved nutritional benefit. See the box inset in my post on making your own homemade almond milk for a brief discussion about why this is a good idea, and keep an eye out for my upcoming in-depth article on soaking nuts and seeds. Drizzle a little of your favorite sweetener on top, and you’re ready to enjoy a delicious breakfast! After you’ve let the cooked oatmeal stand for five minutes, but while it is still in the saucepan, add the maple syrup, cacao powder and vanilla extract, and stir until uniformly incorporated. Then scoop the oatmeal into a bowl and top with the chopped cherries. You won’t need to add any additional sweetener, but to make this truly decadent, you could sprinkle on a small handful of chocolate chips and sliced almonds as well. This recipe caters to my intense appreciation for summer peaches. 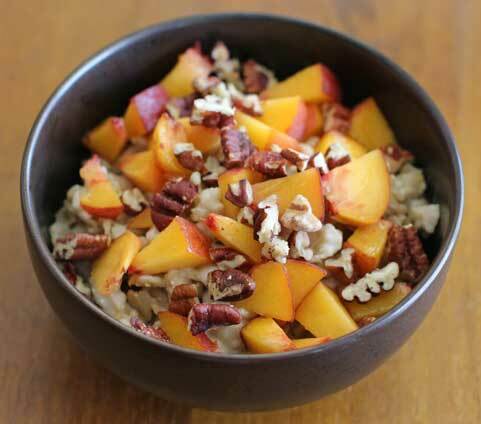 You’ll need a ripe peach and a handful of chopped pecans. A tiny splash of vanilla extract, combined with the coconut milk in the basic recipe, gives it that “peaches and cream” flavor I enjoy so much. 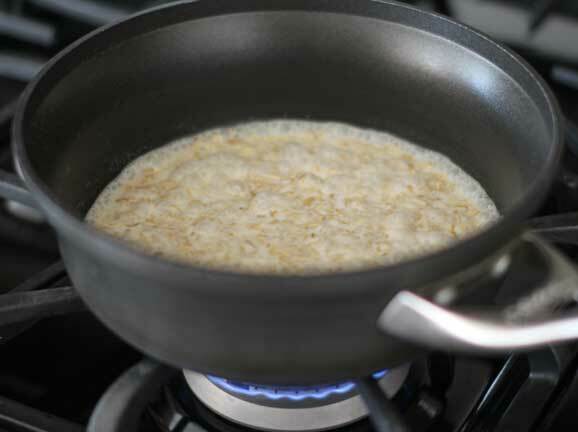 While the cooked oatmeal is still in the pan is a good time to stir in ¼ tsp. of vanilla extract. Scoop it out into a bowl and top with half a peach, chopped (you can leave the skin on, especially if it’s organic) and a handful of pecans. Drizzle with maple syrup or your liquid sweetener of choice. Whole cane sugar (sucanat) would also work well. If you like this last variation, you may also enjoy my Peach Pie for One, another delicious breakfast option that doubles as a healthy dessert. 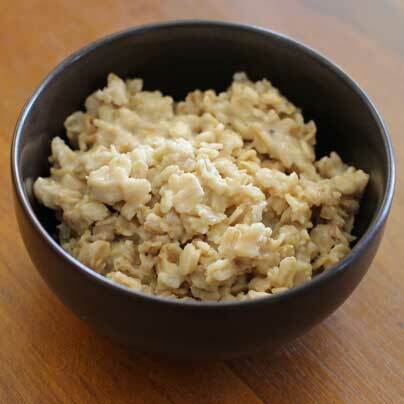 A half cup of dry oatmeal (equivalent to one cup, cooked), which is the amount of the serving in this recipe, delivers 7 grams of protein (more than one large egg). Because they contain a specific kind of fiber known as beta-glucan, oats are known to reduce cholesterol levels, thereby decreasing the risk of heart disease and stroke. Beta-glucan has also been found to enhance the immune system’s ability to respond to bacterial infection, and is recognized for its ability to stabilize blood sugar levels. The same serving of oatmeal provides 77% of the recommended daily value of iron, as well as a good dose of Vitamin A, Vitamin B-6 and calcium. 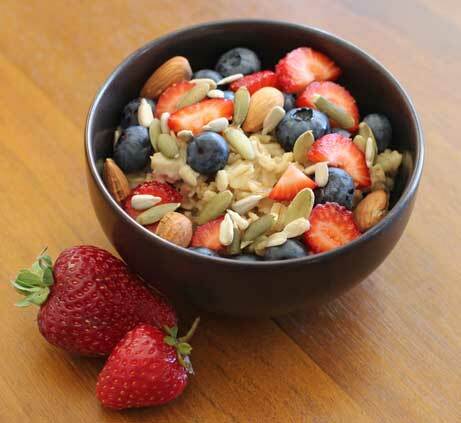 Oats are also very filling, which could help stave off mid-morning cravings and keep you focused until lunch. Depending on your choice of toppings, fresh fruits and berries will add healthful antioxidants, vitamins and minerals to this meal, while nuts and seeds give you healthy fats and an extra protein boost. Packed with vitamin C and antioxidants, cherries are a healthy summer treat. This fruit’s anthocyanins are powerful antioxidants and could help with conditions of inflammation such as arthritis or sports injuries. Cherries also contain Vitamins A, E and all the B vitamins except B-12. Pumpkin seeds (pepitas) offer a nice dose of zinc, which is great for immune support, as well as magnesium and copper. They are also one of the best sources of plant-based omega-3s (alpha-linolenic acid or ALA). It’s best to eat pumpkin seeds raw, soaked (sprouted) and dehydrated, to make their nutrients more available to the body. Almonds and pecans provide protein and healthy fats, as well as dietary fiber and an impressive array of vitamins and minerals. Almonds in particular are an excellent source of Vitamin E, a powerful antioxidant. Raw cacao is full of antioxidants, and studies suggest that cacao may also help promote healthy circulation and blood pressure. In its raw form (unheated, unrefined, without the sugar, milk fat and hydrogenated oils often added to commercially available chocolate candy), it is beneficial to the human body and is known to boost the level of certain neurotransmitters in the brain such as serotonin and endorphins, which produce a mood-boosting, anti-depressant effect. 2 Responses to "Summer Oatmeal, 3 Ways"
Wow! 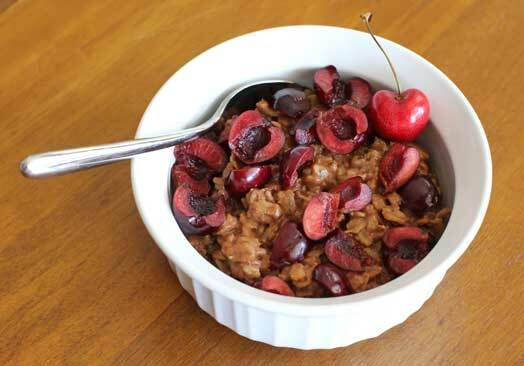 Chocolate Cherry Oatmeal! I bet that is delicious! And so nice to use coconut and almond milk for extra creaminess. I didn’t think I like oatmeal too much, but I think I will change my mind with these ideas.